Summon your heavy hatchling minion. Currently, “baby fat” is the prevailing excuse for this cherubic chick's gigant-like girth. 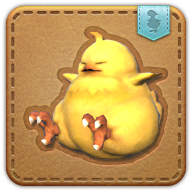 It would be foolish to believe that a chocobo could achieve this size dining on greens alone, regardless of how many hundreds of bushels were devoured...in a single sitting. Chicken bones found beneath the chick's bedding suggest he may have a taste for his succulent cousins.